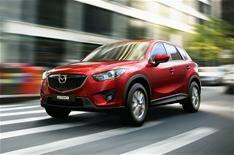 Mazda CX-5 prices announced | What Car? Mazda CX-5 prices will start at 21,395, the company has confirmed. The CX-5 SUV will be the first model from Mazda to include its Skyactiv technology, which brings together new engines, transmissions, body and chassis design to cut CO2 emissions and improve economy. Buyers will have the choice of a 163bhp 2.0-litre petrol engine or a 2.2-litre diesel with either 148bhp or 173bhp. Petrol models are available as two-wheel-drive only, while the lower-powered diesel can come with two- or four-wheel-drive. The higher-powered diesel is four-wheel-drive only. There are four trims: SE-L, SE-L Nav, Sport and Sport Nav. Smart city brake support where laser sensors detect objects in the road ahead and apply the brakes if a collision becomes imminent. Nav versions add 400 to the list price, and an automatic gearbox available on the diesel engines costs 900. The CX-5 goes on sale in the spring, and customers can pre-order now at Mazda dealerships.